SafeStart Systems of Weston, CT has expanded beyond their line of electrical personal safety products with the new SafetyGate™ AV Platinum. This new adaptation of the successful SafetyGate product line was designed specifically to provide restart protection to flat screen televisions, high fidelity audio systems, gaming and other sensitive home entertainment electronics. 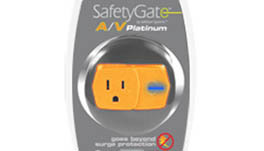 The product has a suggested retail price of $29.99 and will be available at the company’s www.safetygatestore.com ecommerce site in early February 2010. See the company’s website for more information on this and other products by SafeStart Systems.